Some confusion seems to surround the notion of dwarf, semi-dwarf and full sized (standard) fruit trees. Virtually all fruit trees sold these days have started out their life as a normal bud or twig growing on a tree. A nurseryman cut the bud or twig (now called a scion) from that tree and grafted it onto another tree called a “rootstock”. The top of the rootstock is removed so that the growing energy of the roots is transferred to the newly grafted the scion. From that single bud, a new tree is grown. Keep in mind that it is the rootstock that determines the size of a tree; not the bud, variety or other factor. Different rootstocks have different dwarfing capabilities, some will only allow the scion to grow into a very small tree that will stay small no matter how old it gets. Other rootstocks allow a bit more height in the tree, these are the semi-dwarf. Standard (full sized) trees are grafted onto rootstocks that have no dwarfing capacity at all. When planting dwarf or semi-dwarf trees, it is essential that the graft union (the spot where the scion and root are joined) is planted at least 2″ above the surface of the soil. If the tree is planted too deeply and the graft union is below the soil surface, the scion above the union will sprout and grow roots. These new roots will over-take the dwarf rootstock and “cancel out” any dwarfing that may take place. That can be a real problem if you were planning on fitting a dwarf tree into a small area. The graft union shown here is quite visible forming a bump or jog on the trunk. On the other hand, if you for some reason changed your mind about having a dwarf tree and decided you would like a full tree instead, you can just go ahead and plant the tree deep enough so the graft is below the surface. Even with Standard trees however, it is a good idea to keep the graft union above the soil. Often the roots of the rootstock are hardier than the roots of the grafted portion. This can be a real advantage to the tree if it is planted in a less than ideal location. Many mail-order companies will be shipping out their fruit tree orders the next couple of weeks. If you have been out and about I’m sure you have noticed fruit trees for sale in local garden centers as well. The fruit trees you will be receiving from catalog mail-order companies will be shipped bare root; which means just as it says, no soil at all around the roots. Larger nurseries dig their fruit trees in the fall and store them in cold storage units at precise temperature and humidity conditions. By doing that, they are not at the mercy of unpredictable spring weather like we had last month. The smaller nurserymen, those without cold storage, have to leave their trees in the field and dig them as they are sold in the spring. If an unusually warm spell occurs, the trees will begin to leaf out and grow. Since the trees are in a fragile condition at this stage of their growth, they cannot be shipped. So this year the smaller fruit tree growers had an extremely early and short digging and selling season. For the larger growers of course, it was business as usual. A bare root tree has the advantage of growing and developing roots in the soil in your yard, thereby adapting itself to your growing conditions. Trees you find in the garden centers are also a type of bare-root tree even though they have soil around them. In this case the nursery takes the bare root tree and places it into a pot or bag with a moist, light-weight potting mix around the roots. This is done so that the when the tree starts to grow, it can safely be sold at a retail garden store and be in great shape for you to plant into your yard. During the growing season if a fruit tree is not sold, it is usually then moved into a sturdier container. These are the trees in the nursery pots you see at garden centers and are fine to purchase. The containers allow the trees to develop roots and grow like a potted plant. The final type of tree you might see being offered for sale are the ‘balled and burlapped’ trees, sometimes known as “b&b. These trees have been left to grow to a larger size out in the field. When the tree is dug, a large mass of roots along with its’ soil is dug and wrapped in burlap. The nurseryman takes care not to damage the roots and digs a root ball large enough to support the tree after it is planted. The advantage of a b&b tree is that it is much larger and older than a bare root tree. Often these trees are ready to produce fruit that season and you have an “instant orchard”. The disadvantage is the cost of purchasing these trees, even the relatively smaller b&b trees can cost $200 or more compared to $20 for a bare root fruit tree. The cost of shipping a b&b tree is also quite high due to the weight of all of that soil. Also, the tree roots may have trouble adapting to the soil in your yard and simply stay confined to the root ball. The sheer weight of a tree of this type makes it hard to handle as well. Fruit trees are offered for sale as dwarf, semi-dwarf or full size trees; we’ll discuss that issue next time. We found our first Dog Tick (sometimes called Wood Tick) of the season this past Saturday. The warm weather has brought them out early this year. On our property, this has been the only species of tick we have encountered. Fortunately the dog tick does not carry Lyme Disease. Dog Ticks are about 3/16" long. Their bites rarely result in serious disease in Michigan, but like other wood ticks, dog ticks are a known carrier of Rocky Mountain spotted fever and tularemia. The cases of Rock Mountain Spotted Fever reported in Michigan have been from primarily southern counties, particularly those located directly north of the Toledo Airport. Hmmmm… that comment about Rocky Mountain Spotted Fever being found in the counties “directly north of the Toledo Airport” doesn’t give me too much comfort. I guess the lesson to be learned is that you need to check yourself and pets for ticks after spending a day walking or working in an area with tall grass or shrubs. The ticks crawl up onto tall grass or shrubbery and wait for a likely host to walk by, usually a dog or cat (or raccoon or other wild animal). They don’t use trees for this purpose. I spend a lot of time outside, sometimes in areas like those described, and do find a tick now and then. The most I’ve ever found on myself at one time was five ticks. That was several years ago. It was a bad tick year and I spent the whole day working out in an area with tall grass. If you find the ticks right away, they are easy to remove. The longer they stay on, the harder it is to get them off. The ticks have barbs on their mouth that they use to dig deeper and deeper into your skin until they find blood. It takes them a few hours before they actually start “sucking blood” so usually you have plenty of time to get them off. The recommended procedure for removing ticks is to use a pair of tweezers and grab them right at the surface of your skin then lift them straight out without twisting them. Avoid squeezing them to keep their “saliva” from being squirted back into your or your pet’s skin. If left on too long, they will continue to feed on blood until they get “big and juicy” looking something like a disgusting, brown grape…yuk. Don’t let them get to that point! Sometimes you can find a tick starting to swell from feeding on a long-haired dog. This is because when the ticks are small they are easily hidden under long fur. Be aware that the ticks are out now and check your pets often. Once you have transplanted your seedlings into their final growing container, continue your fertilizer and watering schedule. If you are growing them under lights, raise the fluorescent tubes as needed. Check to be sure the seedlings are not getting crowded; separate them if it looks like they are running out of room. What looked like plenty of space at the beginning of the growing cycle can turn into not enough space as the plants get taller and wider. Keep the small fan running on them if you have one. Otherwise stimulate the plants by lightly running your hand over the tops of the leaves a couple of times a day. The movement provided by the fan or your hand helps to strengthen the plants. As garden transplanting time approaches, you need to begin to “harden-off” (or “harden”) your plants. For weeks they have been inside in a safe and balmy environment. If you suddenly remove them from their indoor spot and plant them directly into the garden, they could die (or at the very least be set back in their development) from the exposure to direct sunlight and cool night time temperatures. Hardening-off minimizes this stress. Keep in mind that different plants are set out into the garden at different times. Some can tolerate a light frost so can be set out a week or two before the last frost of spring these include: lettuce, cabbage, broccoli,beets, onions, and spinach. A couple of cold tolerant flowers come to mind, Sweet William and Lupine. Most of the rest of our annual garden plants are considered to be warm season crops and so can’t be set out until after the last frost of the season. 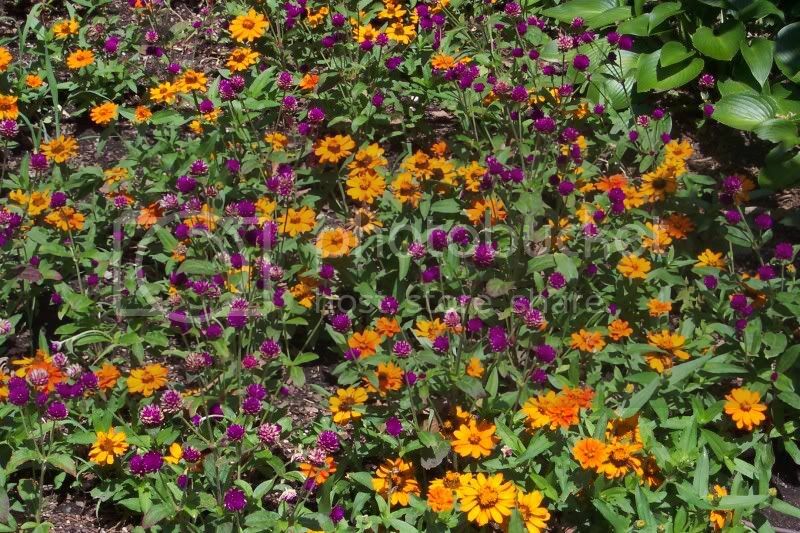 Most annuals need to be transplanted after the danger of frost. The hardening-off process starts by changing the indoor growing conditions. About two weeks before you plan on setting out the plants into the garden, lower the growing temperature and cut back on your watering. Stop fertilizing too. After about a week of indoor treatment, move your plants outside to a protected area out of the wind, the east side of a house works well especially if you can’t be home to move them when needed. On the east side of a house the plants can get the morning sun and are shaded by the time the harshest sunlight occurs in the afternoon. On the first day, leave them out for only an hour; then two hours the next day; then three hours. After a few days leave them out for the entire morning. Eventually (after a week or so) they will be accustom to spending all of their time outside. It is at that point they can be moved into the garden. Just as a reminder, you to keep an eye out on the weather during the time you are getting your plants used to being outside. If your plants should be exposed to a cold snap or severe storm, weeks of work could be lost. There are a few more things that should be considered when the plants are transplanted into the garden. We’ll discuss those in a later post as we get nearer to planting time. Those nasty tents of caterpillars that you see up in the trees in early summer have already begun to appear. The above average temperatures we have been experiencing has caused our local population of Eastern Tent Caterpillars to hatch from their egg masses during the last couple of days. The egg were laid last fall by the adult tent caterpillar moth. It is very easy to get rid of the caterpillars right now because they are only about one-eight of an inch long and very susceptible to sprays or even just squashing by hand. Look for the masses near the ends of the twigs of apple, cherry, plum and other related trees. The egg masses are a little difficult to spot, but once you have see one, it’s a lot easier to recognize them. Many times you can simply snip off the twig containing the egg mass and discard it. This egg mass is already covered with a fine tent web spun by the caterpillars. The dark specks are frass (droppings) from the caterpillars. The egg masses look like a blob of foam that has dried out and hardened. The caterpillars spend the winter in these eggs then hatch out the same time the trees begin to leaf out in the spring. These very tender newly “sprouting” leaves are like baby food to the newly hatched infant caterpillars. The tiny caterpillars are clearly visible in this photo. Sometimes, if a severe rainstorm occurs during this stage, many of the caterpillars will be washed away. Perfect timing of a storm doesn’t happen very often so I wouldn’t count on that to control your problem. The “tent worms” will feed voraciously and devour a lot of leaves but generally won’t kill a tree or cause any lasting damage.